Thanksgiving Day – What's for Dinner Moms? Over the years my Thanksgiving Day has changed in many ways. When I was young Thanksgiving Day was always my mother, father, brother, grandma and myself around the table. This was what we jokingly called a “large” family gathering for us. There was always the traditional dishes- turkey, mashed potatoes, stuffing, corn, rolls and salad. And, as always there was the relish tray. A gold leaf dish my mother received when she got married it made its way onto every Thanksgiving and Easter dinner table. It always had the same 3 things in it too black olives, sweet baby gherkins and celery stuffed with cream cheese. My brother would laugh every time he saw this plate make its way to the table. Relish tray was a word he thought was hysterical and would giggle for hours over it. Then I went away to college. My life was changing and my friends became my family. We always took care of one another. We held holiday dinners where each person contributed what they could. Some years you were doing well and could bring a ham or turkey and other years all you could contribute was a can or two of corn. It didn’t matter. You were family and welcome at the table, always. Most of the group during this time had to break away from their families for many different reasons but we had created our own version of a family. Our holiday tradition continued long after college with “Issue-Free Thanksgiving,” everyone is welcome but leave your issues with each other and your families outside the door. We celebrated Christmas and even a few Easter holidays together. As many of us got married or moved away, had children and reconnected in some form to our biological families our holiday gatherings have been fewer and far between. I am hoping that as our children go to college and life slows down for all of us again we can reconnect and begin our yearly tradition again. For us, well we got married and had 2 children. We started celebrating Thanksgiving and Easter with my in-laws about the time my daughter was born. These dinners were something that were amazing to me. The small family gatherings of 25 – 30 were logistical feats of optimizing space and mass quantities of food that they had down to a science. There were children everywhere and it was loud. But, they loved each other. It was foreign and overwhelming for me in the beginning but I grew to love these family gatherings. Now, as we have moved halfway across the country from our families, we are back to small family gatherings. We don’t necessarily do things traditionally but we have found what works for the four of us. Today we will spend the day in our pajamas. We will eat simple appetizers, play games, watch the parade and a few movies, read and probably take a nap. We will spend the day doing what we love to do, enjoying being together. For us, despite our love of food, it is not about the food at all. It is about being thankful for each other and our little family. Sometime during the evening we will stop and tell stories about the people that we will be missing. I am sure that someone will bring up Grandma’s gravy or Great-Grandma calling my daughter Tickle Britches. 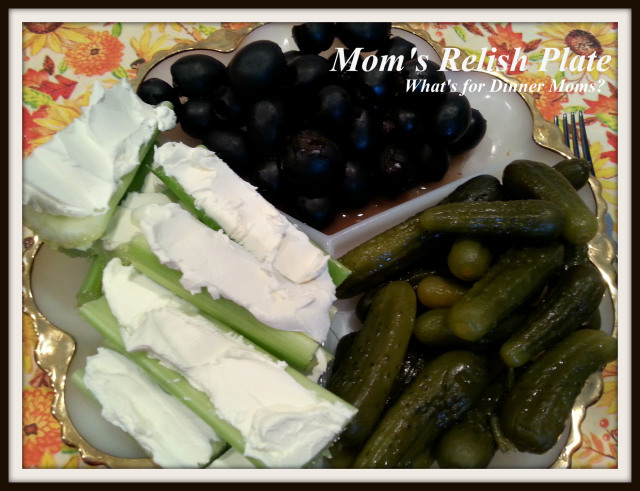 Oh, and the relish tray will make an appearance filled with black olives, sweet baby gherkins and celery stuffed with cream cheese as one of the children will tell the story of Grandma’s relish tray and Uncle George thinking it was the funniest word he had ever heard. Laughter will ring through the house. I hope that each and every one of you are surrounded by those who love you today doing things that bring you joy. Happy Thanksgiving! Nice! Thanksgiving was my mother in law’s favorite holiday. It gave her such joy. How wonderful you have such a great memory of her at the holidays! Happy Thanksgiving. Thank you to What’s For Dinner Moms for supporting Dream Big!! Thank you for all your wonderful blogging tips! Your relish dish looks like the one on the table yesterday, down to the stuffed celery. Amazing how much food is steeped in tradition and family. So much of how we choose what to eat and how we eat is formed even before we knew it. I love traditions and foods steeped in history. Glad it brought back some good memories!